As a consulting and software house, Scheer GmbH supports companies with the development of new business models, the optimization and implementation of more efficient business processes as well as the reliable operation of their IT systems. The development of products and services is focussed in particular on the sector specific accompaniment of companies in their digital transformations. The appearance at trade fairs and exhibitions is one of the most important marketing activities of Scheer GmbH. Capturing leads and sending personalized information has been a long and time-racking process with no statistical insights. The appearance at trade fairs and exhibitions is one of the most important marketing activities of Scheer GmbH. Capturing leads and sending personalized information has been a long and time-racking process with no statistical insights. In addition, cooperation between the marketing department and the sales department was often difficult and intransparent, which led to many communication problems in daily work. For further lead generation, Scheer organizes many webinars. Due to the non-existence interaction of the different tools (webinar providers, CRM), a time-consuming effort was required for each webinar registration, which had to be carried out manually. After the implementation of hileadzz, Scheer GmbH was able to automate the entire process – with great success: great time savings, many highly qualified leads in CRM, structured cooperation between sales and marketing department and high conversion rates in the webinar leads. One of the greatest successes, the automated tracking of leads and the sending of personalized information about products and solutions, put lead qualification on a new level. This project involved several challenges: First, the implementation and integration of our simple process into the long-standing and complex processes of Scheer GmbH. In addition, we showed Scheer’s marketing experts in the shortest possible time how to present the best information about their products and solutions in a business kit for each lead type. In order to better understand their daily routines, we worked closely with the sales and marketing departments. 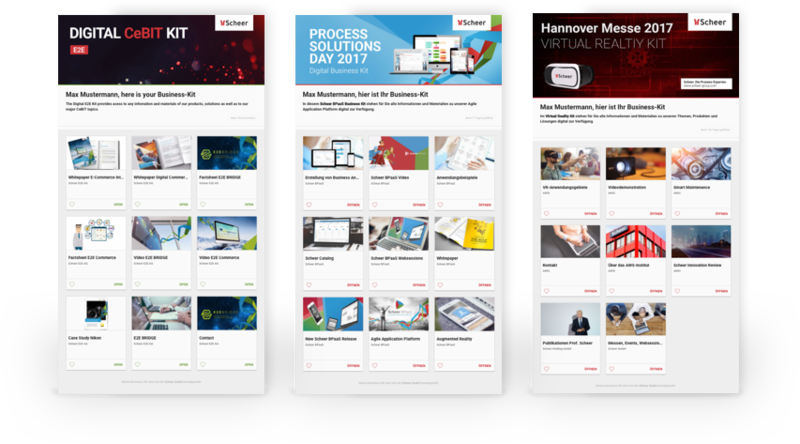 We combined all these insights to implement user-oriented adaptations and thus seamlessly integrate hileadzz into the existing SAP configuration of Scheer GmbH. In addition, we observed the Scheer-team at their first use of hileadzz at the CeBit 2017. This gave us further insights and we could adapt the software further to the wishes and requirements of our customer. After the successful introduction with hileadzz at the CeBIT, the integration into the process of webinars followed. In a short time we have adapted hileadzz to work hand in hand with the external application “GoToWebinar”: when registering a participant in the webinar, hileadzz collects the participant’s e-mail, enriches information, categorizes the lead and prepares it for a simple synchronization with Scheer’s CRM. Scheer is very happy with the results, they are so engaged with our solution, that now they are helping us to improve it and play a role of early adopters of the new functionalities we launch. Together with Scheer’s marketing experts, we achieved a lead-engagement of more than 87% thanks to the hileadzz. Thanks to hileadzz we could increase the automization of our lead process by 79%, decrease the processing time and eliminate the error rate by media disruption. So far seperated systems are now working together smoothly and raise our data quality and the web2lead-time. With the business kits we have the possibility to send leads information packages individually customized towards their interests and can track in the dashboard which of them are in use.